A good debate for the ages is which room in the home is the most important to the daily operation. The laundry room is certainly vital to keeping clothing clean and dry, but most would agree that the kitchen is the central room in any residence. The appliances in the kitchen are highly depended on for keeping food fresh or for preparing it for consumption. Other units are used for cleaning dirty dishes and others to grind up the leftovers. 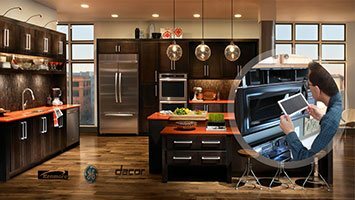 At Appliance Repair South Plainfield we are prepared to provide exceptional maintenance, installation and appliance repair service in South Plainfield, NJ. You can count on our specialists to provide you with the full service treatment on all types of appliances. The South Plainfield Appliance Repair crew is committed to quality services at a very reasonable price. We are passionate about making sure you receive appliance service you can trust whenever you need it. Our highly trained crew will work on refrigerators, ovens, dishwashers, and laundry units too. We promise to successfully service any appliance in your home and you always expect us to do it in a friendly and respectful manner. Every appliance service technician on our team has the qualifications to professionally install and maintain all household units. We work hard to reduce stress by providing services that make your life easier. The foundation of our business is built on excellent home appliance repair service. Our local company is dedicated to being the service provider our friends and neighbors can depend on in their time of need. We have established a wonderful reputation for ensuring quick and accurate appliance repair service. When one of your kitchen or laundry room appliances goes down, call the experienced crew at Appliance Repair South Plainfield for outstanding results that will not let you down.